Dow Jones News Fund interns spent 10 days sharpening their skills at the University of Texas workshop. Seated: Katie Bast. Ethan Metcalf, Frannie Sprouls, Elizabeth Robinson and Bradley Wilson (faculty). Standing: Zane Sparling, Lyndsey Nuckols, Rebekah Wahlberg, Bill Hall, Tara Bryant, Jordan Shapiro, Casey Hutchins, Alicia Balog, Chloe Gonzales, Griff Singer (faculty), Beth Butler (faculty) and Amy Zerba (faculty). Thirteen college students and recent college graduates are headed to paid copy editing internships on daily newspapers after completing 10 days of intensive preparation at The University of Texas at Austin. The interns are among a select group of undergraduate and graduate students placed in internships in copy editing, sports copy editing, business reporting and digital journalism. 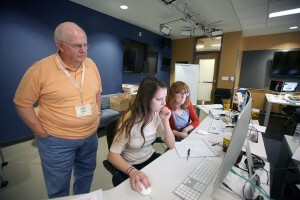 The School of Journalism at UT Austin, one of five pre-internship training sites for newspaper print and online copy editors and designers, has been part of the News Fund program since 1998. Participants in the UT workshop were involved in newspaper copy editing, design and production assignments and operated a parallel online news operation. Newspaper professionals, visiting faculty and UT journalism faculty moderated the sessions in this 17th residency program at UT Austin. In the latter half of the pre-internship training, participants produced three issues of a live, model newspaper, the Southwest Journalist, as well as a companion online product, swjournalist.com. Alicia Balog, Kent State University, The (Portland) Oregonian. Katie V. Bast, University of Wisconsin-Eau Claire, The Sacramento Bee. Tara Bryant, University of Kansas, Bay Area News Group-East Bay, Pleasanton, California. Chloe McCall Gonzales, University of Texas at Arlington, Austin American-Statesman. Casey Hutchins, University of Kansas Corpus Christi Scripps newspapers production center. Ethan Metcalf, Midwestern State University, Corpus Christi Scripps newspapers production center. Lyndsey Ruble Nuckols, Harding University, Orange County Register. Elizabeth Robinson, University of Texas at Austin, The Beaumont Enterprise. Jordan Shapiro, University of Missouri, The Los Angeles Times. Zane S. Sparling, Willamette University, Houston Chronicle. Frannie Sprouls, University of Nebraska- Lincoln, The Denver Post. Bill Hall, Cal State University-Chico, San Francisco Chronicle. Rebekah Wahlberg, California Baptist University, Alabama Media Group, Birmingham. Directing the UT workshop were S. Griffin Singer, director; George Sylvie, assistant director; and Lourdes Jones, senior administrative associate of the UT School of Journalism. Faculty included Beth Butler, assistant workshop director, from Kent State University; Bradley Wilson, assistant professor of journalism at Midwestern State University; Amy Zerba, a senior staff editor of The New York Times; Linda Shockley, deputy director of the News Fund, Princeton, New Jersey; and Dan Cunningham, deputy managing editor of the Houston Chronicle. 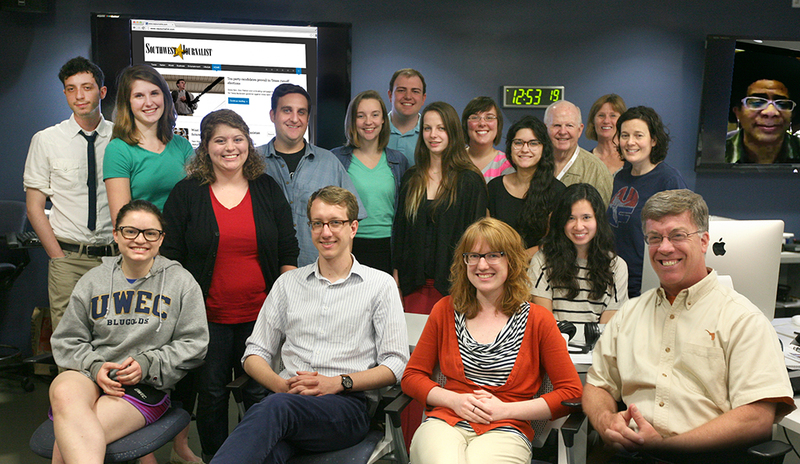 Kathy Blackwell, a senior editor of the Austin American-Statesman, coordinated the interns’ visit to that newspaper. Other newspaper training centers were at Temple University, the University of Missouri, Pennsylvania State University and the University of Nebraska. A digital journalism workshop was held at Arizona State, and a business reporting workshop was conducted at New York University.